In celebration of Earth Day, the Associated Students and its campus partners offer a week of speakers, workshops, documentary screenings, music, art, a group bike ride, and more. Earth Week kicks off on Monday, April 22, with a 5:30 p.m. banquet featuring keynote speaker, David Cobb, as well as the Trashion Show and the Sustainability Champion Awards ceremony. 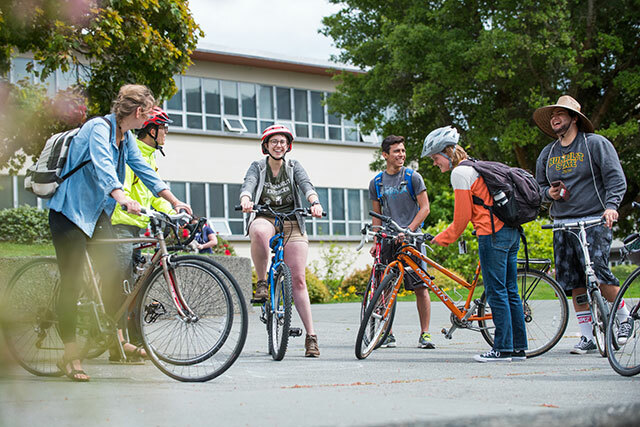 Students head out on the Earth Week Inclusive Bike Ride. This year’s ride takes place on Friday, April 26 from 5-7 p.m. Meet at the corner of Harpst and B streets.Cobb is an attorney who ran for U.S. president on the Green Party Ticket, co-founded Move to Amend, and is a member of the North Coast People’s Alliance. Read his full bio online. This annual, student-run event focuses on the challenges, ideas, and solutions to move us towards a sustainable future. This year’s theme is “Building Resilience in a Time of Crisis.” Join us as we explore challenges and celebrate new approaches to building resilient communities, network with your peers, and leave feeling inspired to take action. Other events include an informational session on Mobile Energy On Wheels (MEOW)—a student-initiated demonstration trailer equipped with solar panels, an inverter, charge controller, and pedal power bicycle generators—and the Humboldt County Climate Action Plan Forum, which is a dialogue on local efforts to reduce greenhouse gas emissions. For a complete schedule, with workshop descriptions, visit the Associated Students website. Earth Week is organized by the Earth Week Every Week Committee, a coalition of Associated Students programs and student clubs, with support from the Office of Sustainability. Their mission is to plan programs, events and workshops throughout the year that seek to educate, create community and foster dialogue on issues of social and environmental justice, human and non-human rights and healthy lifestyles. The Earth Week Planning Committee works to ensure all events and programs are inclusive and representative of the diversity of race, ethnicity, gender, age, national origin, religion, disability, sexual orientation, socioeconomic status, education, language, and physical appearance that we see in this world. If you need additional accommodations to fully participate in the events as described, please contact hsuas@humboldt.edu.